For long bike rides it is nice to have alternative hand and seating positions. 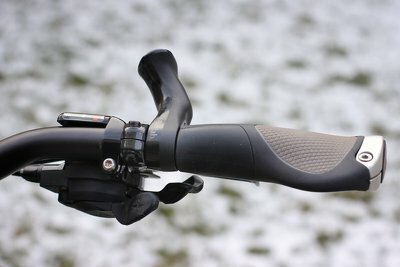 By changing where you put your hands your position shifts slightly and the contact points on the saddle change slightly. When I got the Ergotec Boomerang handlebar I was hoping that I could use the middle bar for extra hand position, but there was not enough space and put a more pressure on the wrists that I would want. Two years later I added an tribar which gave me extra hand positions, but turned out only to be usable in very specific situations while adding constant bulk to the bicycle. 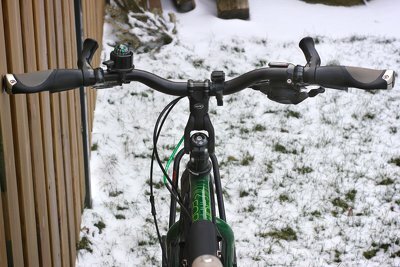 What I wanted to try was to put some barends on my handlebar. But my current handlebar was too small. My only option would be to replace the Ergon grips with some that have integrated barends, but the backsweep of my handlebar would make them stick out a lot. I don't like the idea of these things sticking out on the sides. It seemed like I was running out of options with my current handlebar and I decided to replace it with something a little bit more conventional. I decided to get the Ergtec Ergo XXL. 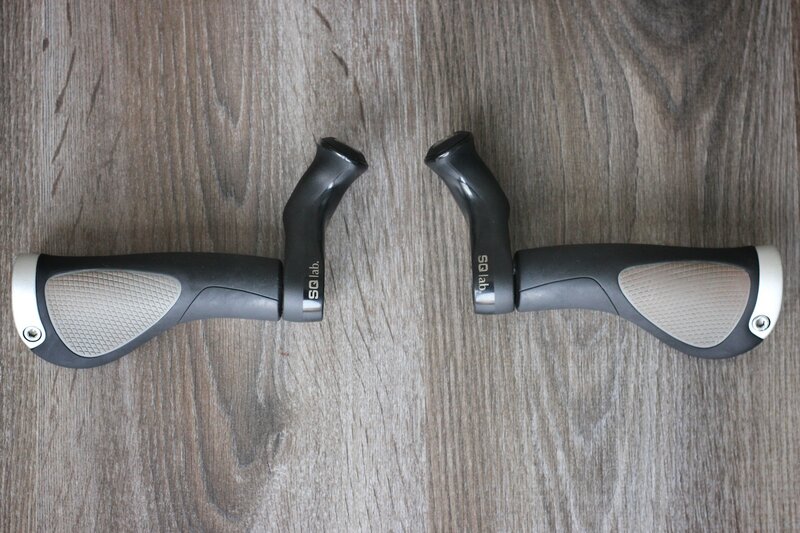 This handlebar is 650 mm wide, 16 degrees backsweep and has grip lengths of 210 mm. 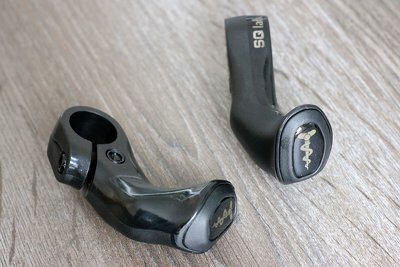 SQlab showcases this product on their 302 and 311 handlebars which also have 16 degrees backsweep, so I was confident that this an appropriate amount. The idea of putting a barend between the grips and use it like an mini aerobar is not new. People have been moving their bar ends around for at least a decade. 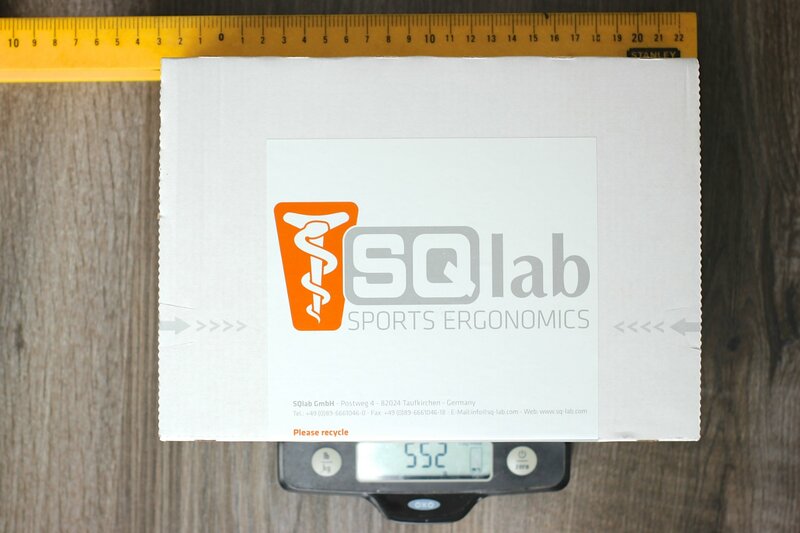 What SQlab has done here is created a product that is specifically meant to be used this way. SQlab is known for producing bicycle saddles, handlebars and grips that have been ergonomically engineered to be comfortable to use. The SQlab 411 barends sell for about 40 euros or 45 dollars. I got mine on Amazon, the orange versions were significantly cheaper there, but since I got the black version I the difference in price with other shops was minimal. 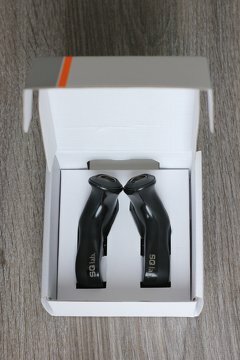 I think it's quite a hefty price tag, they are more expensive than my handlebar, grips and tribar, but it's a pretty unique product so there is no cheaper alternatives at the moment. Although the barends themselves are small enough to fit though the mailbox I received a sizable box. within the box was an SQlab box which seemed suspiciously heavy. There was a request to please recycle this box printed on it. Inside there was a whole bunch of paperwork, some carbon grip paste and another box. The box was 552 grams. 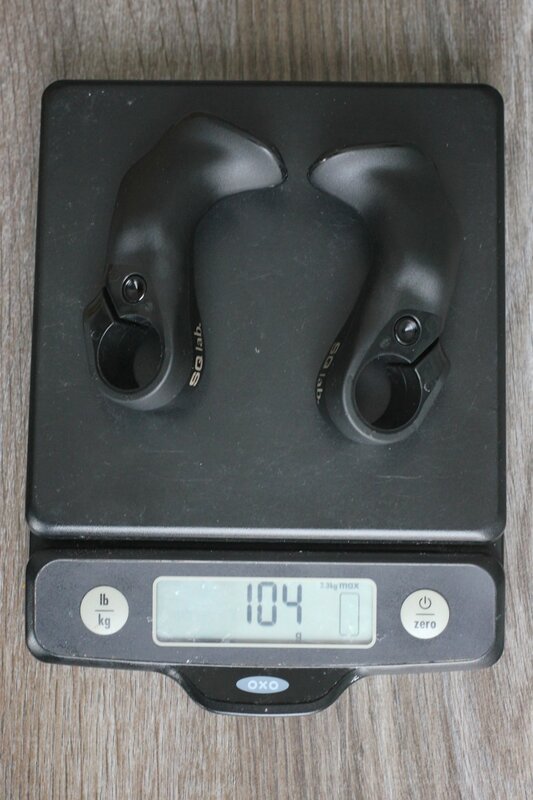 I weighed the barends to be 104 grams (108 grams was specified). This means that over 80% of the weight was packaging, excluding shipping box. 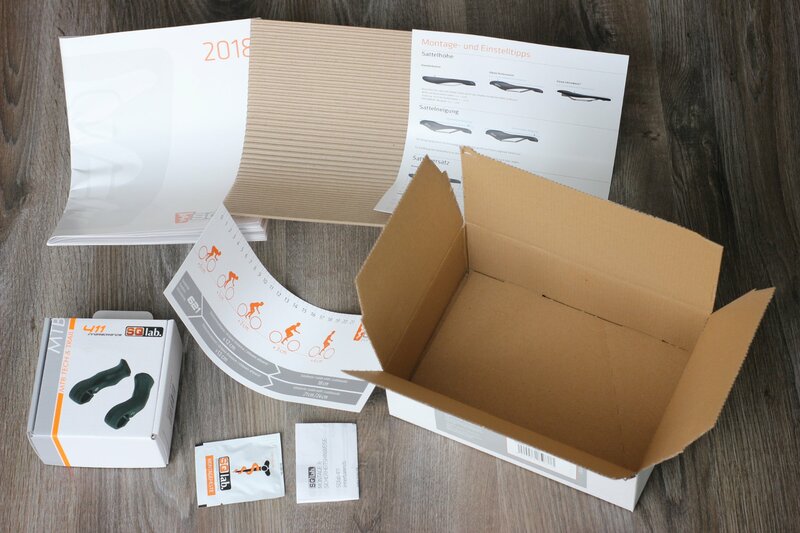 My advice to SQlab would be to reduce the amount of packaging and reduce the impact on the environment and their customer's wallets. At least most of the packaging was paper, not plastic. That's a big and heavy box they want me to recycle! So much stuff I never asked for. A small box within a box. Neatly displayed bar ends inside their own box. The SQlab 411 inner barends originally was only available in one color; black with orange tops. Since orange is not the most subtle color they also released an all black version. 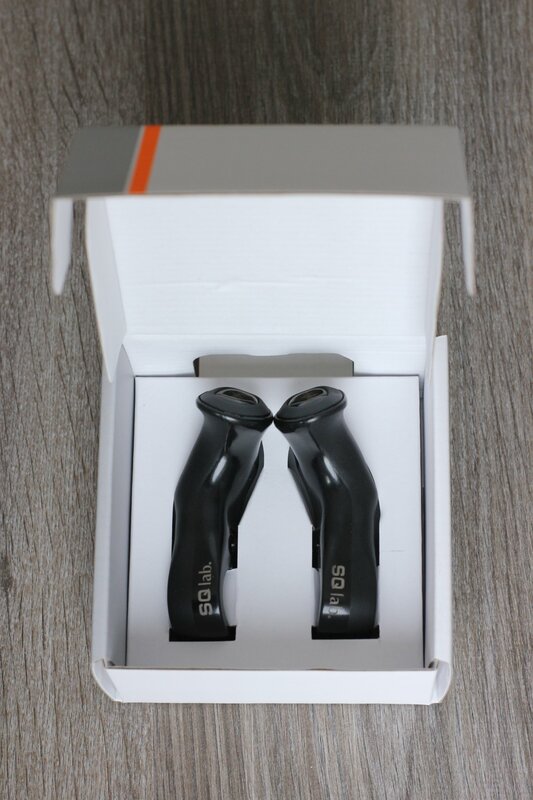 I got the black version, even paid 4 euros more for it, since the only bit of orange on my bicycle are the legally required reflectors on the pedals and I would like to keep it that way. The barends are made out of solid plastic, smooth on the inside and with a rubbery texture on the outside where the hands rest. The name SQlab is printed on the rider facing side. Personally I'm not a fan of their logo. The serif font makes it look cheap. On the underside there is a black hex bolt that screws in another metal insert that provides a strong connection. One side is shiny, the other one rubbery. The top has a medical looking logo on there so people will think you are a doctor. At least it's not orange! 4 grams lighter than advertised! Barends next to some Ergon GP1 grips. To be honest I did not read the manual. I was installing a new handlebar and out the barends on right after the brake levers. Even when loosening the bolt they have a tight fit that makes it hard to slide them around. The good thing is that they stay in place while adjusting the position. There are no markings on the barends to indicate their angle. I mostly positioned them by feeling. But to really feel them you need to tighten them and put pressure on it with your hands, so that took a few turns. 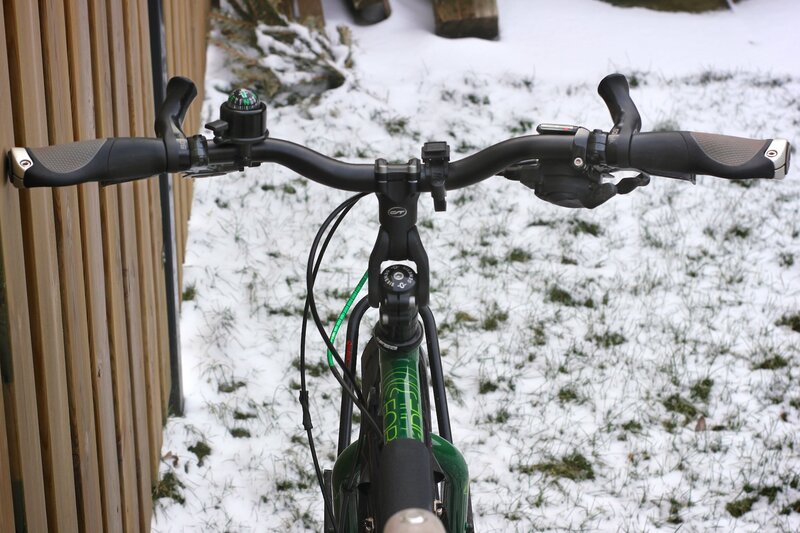 The bolts require a hex key, one size larger than all the other handlebar bolts. Usually I hate it when they are different, but in this case I don't mind so much. A bigger key size makes it harder to strip the bolt and since my weight will be resting on these things they need to be tightened well. I always have different sizes hex keys with me anyway. The lever of my trigger shifter prevented me from accessing the bolt on the right side, so I had to loosen the shifter first. A minor inconvenience. Barends from the rider's perspective. From the front the black barends visually blend in with the rest of the stuff on the handlebar. Barend installed on the left side. 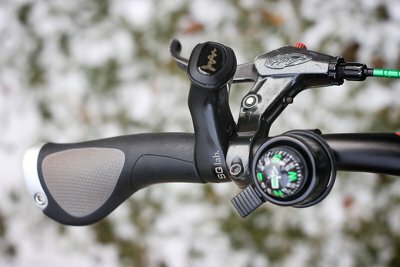 Barend on the right side, the shifter lever obstructs the bolt of the barend. Holding the barends is quite comfortable. It is a little surprising since you are only holding the top half. The part of your hands is resting on the grips. Depending on the angle of the barends you can balance between how much support they provide. I found my wrists to be quite relaxed. 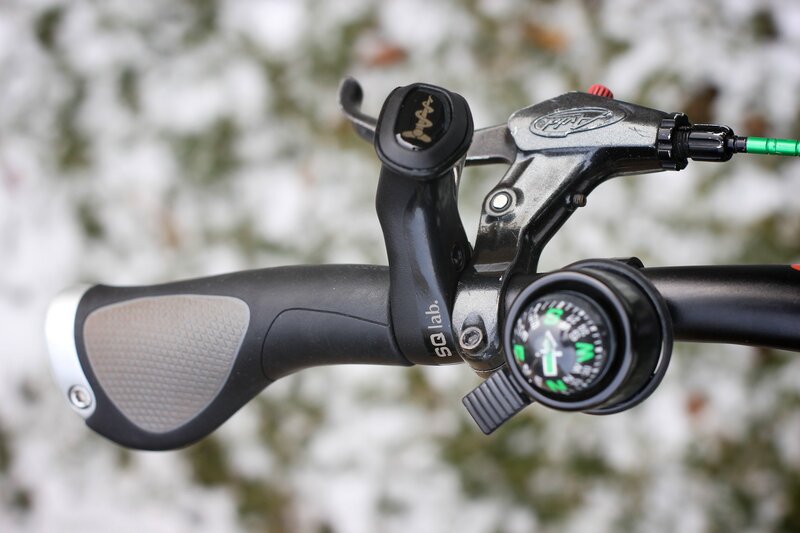 I am also impressed that the brake levers are still usable. I can still access them with my ring finger and pinky. 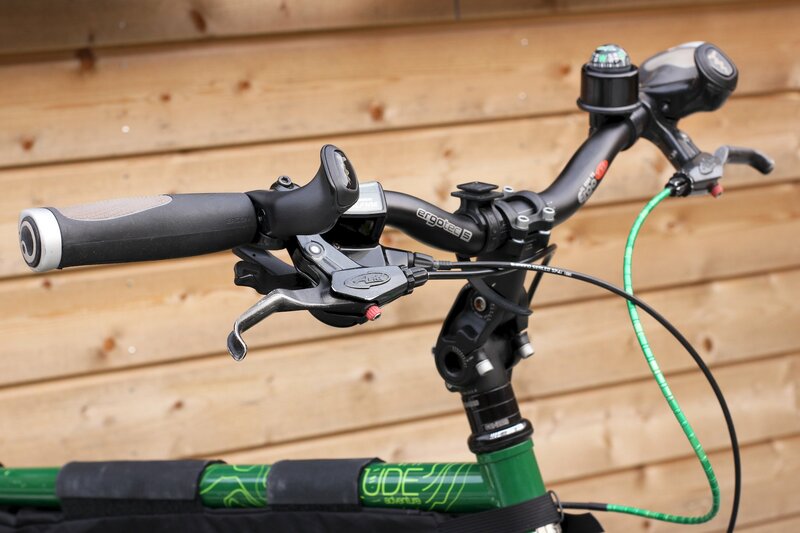 Modulation is more limited as these fingers do not have much strength and coordination as the middle and index fingers, but it's better than other barends or hand positions where you need to move your hands to reach for the brake levers. Of course it helps to have brakes which can be controlled with a single finger. 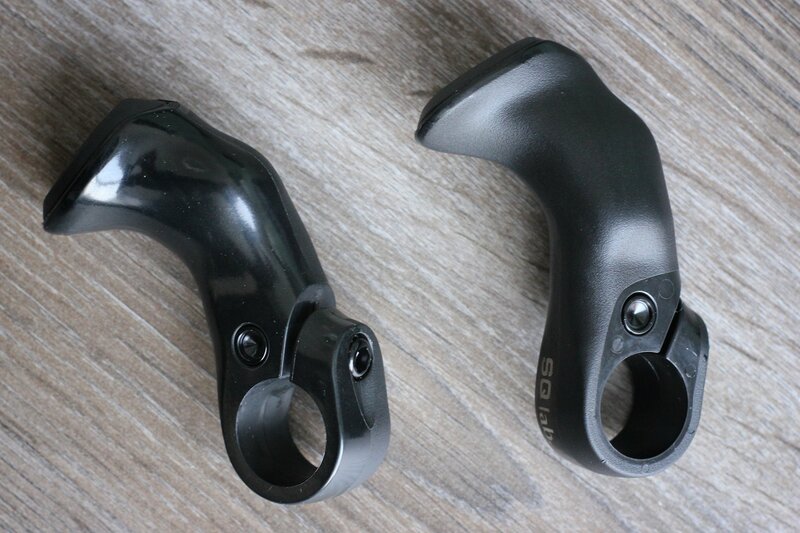 To make space for the barends the grips had to be moved away about 10 mm further from the shifter and brake lever. I was expecting that this might be a problem, but it does not yet seem to be an issue. 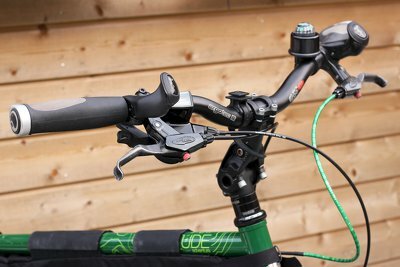 If it turns out that I don't like it I will consider shortening the grips by cutting of a piece so that the ends move more towards the middle of the handlebar. So far so good, but I haven't really used them yet. As you can see in he pictures it is still a bit snowy at time of writing. I will update the conclusion in a few months after riding with the barends. For now I am optimistic about them. 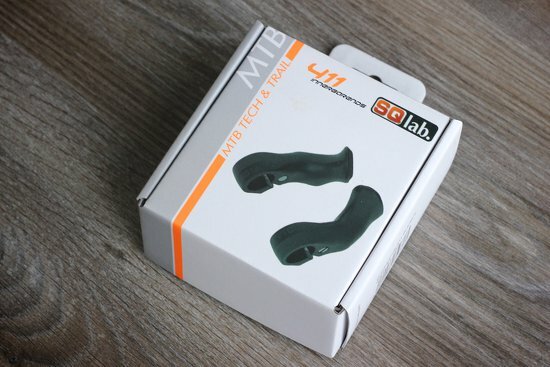 Review of SQlab 411 on 311 handlebar.